The second post-release patch of substance went out today for FIFA 19. While the first one that arrived early this month primarily dealt with fixing issues coming off release of the game, this update features more adjustments made in responding to consumer feedback with an emphasis on gameplay and Ultimate Team. ♦You can now make changes to your Game Plans in the Pause Menu during a match. Changes made to your Game Plans during a match will not be saved after completion of that match. Swapping players in the Pause Menu during a match, while on Balanced Game Plan, will now apply those changes to other Game Plans. This only applies if you make the changes to Balanced Game Plan, changes made in Pause Menu during a match to other Game Plans will be localized to only those and would need to be made manually in the others. In situations where the formations being used in your non-Balanced Game Plans are significantly different than those in your Balanced Game Plans, the swaps may not happen automatically. For example, if you are playing with a formation, on your Balanced Game Plan, that has a Left Back, and swap a Striker into the Left Back spot, and then change to a Game Plan where there is no Left Back, such as a three at the back formation, the swap may not be made automatically. ♦The following issues were addressed for volleys where the player fully leaves the ground during the kick, such as a bicycle kick. Some players were incorrectly taking these kicks without meeting the Agility attribute requirements to do these kicks contextually. These types of kicks can happen, in appropriate situations, for players who have an Agility attribute of 80 or higher, or who have the Flair Trait, without the player having to hold down the ‘Flair Shot’ button. These kicks were happening in unrealistic situations, such as when the kicking player was bunched up with other players. Sometimes the animations for these kicks were happening too fast for some players with higher Agility attributes. These kicks are now more likely to be impacted by error resulting in potentially less accuracy, speed and spin. The above effect will be more noticeable in situations where executing one of these kicks would be very hard, and less noticeable in situations where executing one of these kicks would be easier. ♦Rarely, keepers were not picking up the ball when it was close to them. ♦Rarely, keepers were trapping the ball outside of the box, despite an attacking player being near them, instead of clearing the ball. ♦Rarely, when the keeper was rushing out of the net, you were unable to take control of him using the ‘Move Keeper’ controls. ♦Rarely, after positioning your keeper with ‘Move Keeper’ controls, the keeper would dive out of the way of the incoming shot. ♦Rarely, keepers were not picking up the ball after knocking it down with a tip down save. ♦When playing in a mode with two human controlled players on a team, such as in Pro Clubs or Co-op Seasons, the opponent’s defenders were not responding to an attacker running behind the defensive line during a goal kick. ♦When taking a goal kick, where the target for the kick is very far down the field, the ball was travelling too fast. ♦Players will no longer wait to take a throw in due to a keeper being out of position. ♦Your opponent’s FUT Club Established Date will no longer be displayed. ♦Your opponent’s FUT Club name and Squad Name will no longer be displayed. ♦Your opponent’s online ID will no longer be displayed on the screen with one exception. ♦You will still be able to see your opponent’s online ID if you use the ‘List Members’ button, which we are working to remove in a future title update when available. ♦The impact to a player’s attributes from Chemistry were not properly displaying in the Pause Menu of a FUT Online Match. ♦This was a purely visual issue with no impact to gameplay. ♦The Squad Battles refresh timer was very rarely not counting down correctly for some players. ♦The Daily Objectives refresh timer was very rarely not counting down correctly for some players. ♦The latency bars in Division Rivals were not properly updating based on the latency to the dedicated game server location being used for the match. 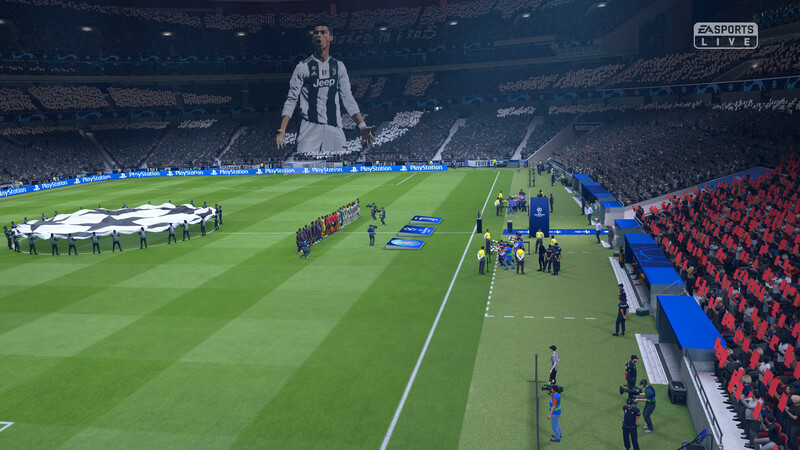 ♦The change to your Skill Rating was not being visually depicted as part of the end of the match flow in Division Rivals after a loss. ♦Sometimes a player’s FUT Coin balance would display as 0 after being outbid on an Item on the FUT Transfer Market. This was a visual issue only. ♦Stability issue when rapidly pressing buttons on multiple controllers while on the Apply Consumable screen. ♦Rarely, when viewing a Champions Channel replay, you would receive an error. ♦Resolved some issues where the Pause Menu would not close, and would remain on the screen, after the countdown timer had reached 0. ♦Sometimes, in Pro Clubs, your Virtual Pro would be playing the wrong position in a match. ♦This issue was only impacting certain positions when playing in certain formations. ♦Sometimes the game would hang after checking the Mail Inbox immediately after the transfer window deadline day ended. ♦Some Traits had a blank icon on the Attributes panel of the Squad HUB. Traits impacted by this were those added to the Front End in the previous title update. This issue was visual only. ♦The Playmaker GTN Scouting Instruction no longer has the (CPU AI Only) tag on it. ♦This was a visual only issue caused by a Traits change in a previous title update. ♦The EFL Championship trophy is now being presented in the final match of the EFL Championship Cup. ♦Having more than 89 unlinked Kick Off Names was causing an error to appear when proceeding to the match selection screen. ♦The wrong Favorite Team crest and name combination would be showing on the Kick Off tile if the active account was switched. ♦If one player set themselves to ‘Ready’ on the Kit Selection Screen, while the other player backed out of the screen at the same time, the player who has set themselves to ♦’Ready’ would no longer have any functionality on the Team Select screen. ♦Rarely, Kick Off names that were not created by the player would appear in the list of available Kick Off names to select. ♦The Chipped Penalty Trait no longer had any functionality in gameplay and will no longer display in the Front End. This is a continuation of the changes that were made to traits in the previous title update. ♦The Speed Dribbler Trait now correctly has the (CPU AI Only) tag. This is a continuation of the changes that were made to traits in the previous title update. ♦Some Traits were displaying as debug text for some players. ♦Toggling between the ‘On’ and ‘Off’ settings for some FIFA Trainer options were causing other changes made to FIFA Trainer options to change. ♦Updated the intro audio for DFB-Pokal. ♦The away team in a UEFA Champions League group stage match was getting audio saying that they won the second match, even if they lost, if they had won the first group stage match. ♦Your opponent in an Online match will no longer be able to skip your goal replays. ♦Updates to a number of team kits. ♦Updates to the Nike Black Cat boots. ♦Updated the stadium art for the Sydbank Pokalen tournament. ♦Rarely, keepers, after making a save, would warp into the net. ♦Rarely, when the keeper was making a save close to the 18 yard line or the byline, they would perform a slow animation while getting up when it was not appropriate. ♦Rarely, the keeper would start to dive in one direction to make a save, and would instead animate as diving in the other direction. ♦Sometimes a player would remain suspended in the air for a prolonged period of time following a mid-air collision. ♦Three character abbreviation for some teams was incorrect in some languages. ♦Full team names for some teams were incorrect in some languages and have been corrected. ♦The scoreboard in Olympiastadion had the crests assigned to the wrong scores. ♦Collision issue with the team seating area in Otkritie Arena. ♦Corrected an issue with the stadium art in Signal Iduna Park. ♦Sometimes the crowd would be missing assets like flags or cell phones during crowd shots. ♦Fixed issues with a number of team kits. ♦Corrected the trophy displaying in the 3.Liga playoffs. ♦Sometimes a trophy’s reflection was showing images of skill game assets. ♦Sometimes the post-goal wipes in FIFA Ultimate Team would be an incorrect version. ♦Some boots were clipping into the player’s socks and into the grass.